We are looking for an experienced Medical Assistant with skills and experience in Clinical Medical Assistant and scribing. This position is with a small private practice located close to Grossmont Hospital. The role will support 3 Doctors with Medical Assistant Duties and scribing Doctors notes to EMR. The pay rate is $18 – 22.00 hour based on experience. Benefits include health and dental insurance, paid time off, paid holidays, 401K savings plan. 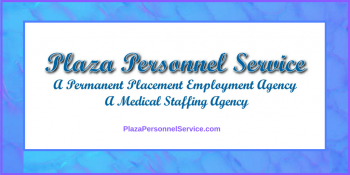 For other opportunities offered by Plaza Personnel Service, as well as articles of interest as well as some fun stuff, please visit our blog at Plaza Personnel Service Blog and check back from time to time. Do you have a favorite social media site? Plaza Personnel Service is on Facebook, Pinterest, Twitter, Yelp, LinkedIn, YouTube, Instagram and Google. Check us out on your social media site.